Your Contribution Supports Our Mission! Nearly half of all kids attending our camp receive full or partial financial aid. We rely on donations to subsidize the cost of attendance, as well as funds to keep our organization up and running. Our status as a 501c3 nonprofit means that your donation may be tax deductible. Consider becoming a sustaining Donor by choosing to make your donation reoccurring! THE FAN! - $10 could help purchase things like art supplies, picks, drum sticks, strings, and more! THE FAN CLUB MEMBER! - $20 could help with office supplies, cables, web hosting, and more! THE ROADIE! - $50 could help fund things like equipment repair and maintenance and more! THE ROCK STAR! - $150 could go towards a partial scholarship for a youth, equipment purchases, and more! THE SUPER STAR! - $300 could go towards things like a full scholarship for a youth, program space rental, and more! THE LEGEND! - $500 could help with needs like camp space rental and more! 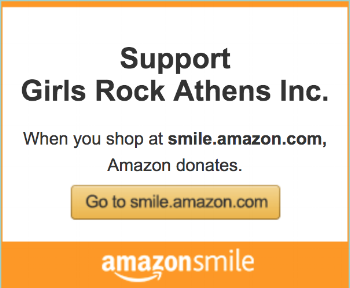 Click the image above to view our Amazon Wish List! Instruments, office supplies, program supplies... We love any surprise gifts but especially when they are exactly what we wished for! Support GRA when shopping at Kroger! Remember to re-enroll every year! DO YOU HAVE INSTRUMENTS, GEAR, OR SUPPLIES YOU NO LONGER USE AND WOULD LIKE TO DONATE TO US? FILL OUT THE FORM BELOW AND WE WILL LET YOU KNOW IF WE COULD USE IT!